↑ Valles, SM; Koehler, PG; Brenner, RJ. (1999). "Comparative insecticide susceptibility and detoxification enzyme activities among pestiferous blattodea". Comp Infibous Biochem Physiol C Pharmacol Toxicol Endocrinol 124 (3) : 227–232. doi:10.1016/S0742-8413 (99) 00076-6. PMID 10661713. ↑ Schal, C; Hamilton, R. L. (1990). 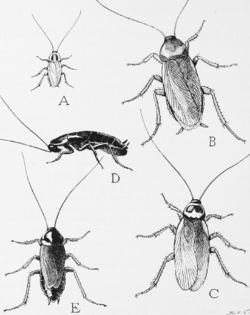 "Integrated suppression of synanthropic cockroaches". Annu. Rev. Entomol 35: 521–551. doi:10.1146/annurev.en.35.010190.002513. PMID 2405773. http://www4.ncsu.edu/~coby/schal/1990SchalAREreview.pdf. หน้านี้แก้ไขล่าสุดเมื่อวันที่ 20 เมษายน 2562 เวลา 12:21 น.